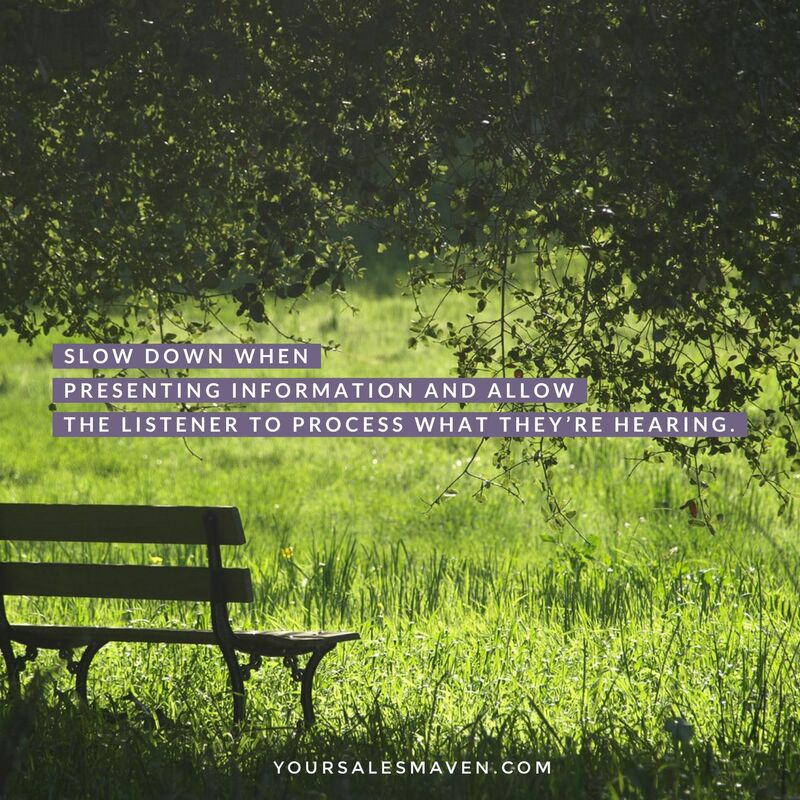 When was the last time you found yourself listening to someone’s sales presentation where the person was talking so fast, you couldn’t even follow along? Maybe you tried to stay engaged but ended up feeling frustrated. At some point, you shut down completely and just waited for it to be over. A common misstep people make when giving a presentation or demonstrating a product is they rush through it. They worry they are taking too long so they increase their rate of speech to try to fit it all in. This often happens when making a proposal as well. This is a sure-fire way to talk people out of wanting to know more or wanting to hire you. A more effective approach when presenting is to slow down and let the listener process what they’re hearing. People will actually listen longer when you give them time to process what you’re saying. It can be challenging to slow down your pace. Many of us suffer from the compulsion to want to give more than what’s expected. It’s common to want prospects to know “all the things” about our product/service. We talk as though time is running out. We are all experts in our fields. The information we’re presenting to a prospect is something we already know. It already makes sense to you as the seller. However, for people hearing it for the first time, it’s new and it takes time to digest. Prospects need to process what is being said and decide how they feel about it. They need to determine if it meets their needs/solves their problem. Slow down and allow the prospect the time needed to process information so they’re able to make the decision to hire you. One final tip – pay attention to when a prospect/client is taking notes. Stop talking and let them finish writing before moving on to your next point. This is a sign of respect for your prospect/client and it’s an easy way to remind yourself to slow down your rate of speech. Wishing you an amazing week of connecting and building long-term client relationships!